Pasta salad is an ideal dish to eat during the warm months—it needs little cooking, can be made ahead, and is great served cold or at room temperature. It is also very flexible, allowing you to add protein, vegetables, herbs, and different dressings. 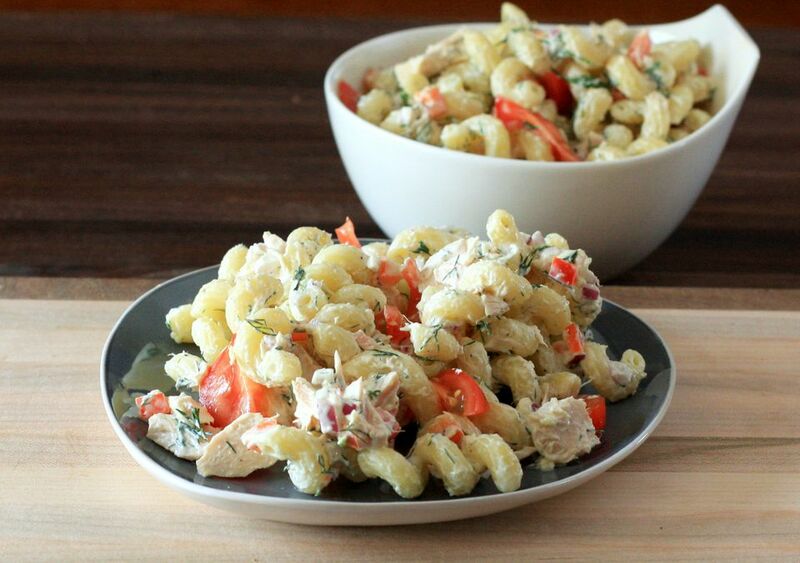 This flavorful pasta salad features white tuna, chopped red onion, red bell pepper, garlic, and sliced grape tomatoes. The fresh dill and lemon juice add a bit of brightness to the creamy dressing, making this pasta salad perfect for an everyday lunch, or as a side dish at your next cookout. Cook the pasta in boiling salted water following package directions; drain, rinse, and set aside. In a large bowl, combine the tuna, finely chopped onion, minced garlic, bell pepper, dill, and lemon juice. In a small bowl or cup, combine 3/4 cup of the mayonnaise and the sour cream. Put the pasta in the bowl with the vegetables, add the mayonnaise mixture, and gently toss to combine. Add more mayonnaise if necessary to reach desired consistency. Add the sliced tomatoes and stir gently. Taste and add salt and pepper to taste. When choosing the type of tuna to use in this recipe, you need to decide how strong you would like the tuna flavor to be. White tuna (including solid white albacore and chunk white) has a more mild flavor, as well as a firm texture. Light tuna, which is often a mix of a few different types of tuna like skipjack and yellowfin, will have a slightly stronger flavor. It is also the least expensive. If the pasta is still warm when you dress the salad, it will absorb more of the dressing; so if you like a very creamy pasta salad wait for the noodles to cool down before mixing in the mayo and sour cream. For cookouts and picnics, make sure to follow the 2-hour rule. Food must be eaten within 2 hours from the time it's taken out of the cooler or refrigerator. If the temperature outside is 90 F or above, you need to cut the food's exposure time to 1 hour. If you're not a fan of mayo, or would just like to try this recipe with a lighter dressing, skip the mayonnaise and sour cream and use a good-quality fruity olive oil in its place. Instead of adding the lemon juice along with the tuna and vegetables, whisk it along with about 1/4 cup olive oil until emulsified. Drizzle over pasta salad and toss to combine. Then add the tomatoes, salt, and pepper. Replace the tuna with chopped cooked chicken, turkey, or ham.